San Francisco: Crossover utility vehicles (CUVs) are the rage today. Over the last ten years, sales of car-based vehicles that act like SUVs have boomed from essentially nothing to about 2.5 million units. Subaru has been in the thick of it from the start, with its sturdy, comfortable Outback. The Outback debuted in the mid 1990s as a rugged-looking wagon with standard all-wheel-drive and a hint of enhanced ground clearance. Unlike trucks with big levers to engage the mud-only 4WD, this was a car you could drive to the summer cabin one day and to the opera the next. You might say the Outback gave Subaru a new lease on life, because shortly after, the company became America’s first all-wheel-drive only manufacturer. The Forester arrived a few years after the Outback. The Forester borrowed the tall, square roof and chunky lines from SUV leaders like the Ford Explorer and Jeep Cherokee, while retaining the same car-based Subaru goodness under the skin. In the Forester, the roof may be high, but you sit at essentially car height. The Forester was restyled a few years ago, but for 2006 it gets a profoundly altered face and a more modest freshening to the tail. The new nose carries a wide version of the new slim grille introduced recently on the larger B9 Tribeca luxury crossover. The new, larger mirrors get integrated turn signals. 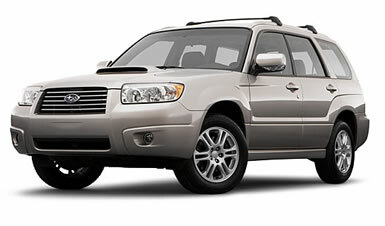 For 2006, engine power grows, particularly for the turbocharged, intercooled 2.5 XT. Its horsepower jumps from 210 to 230, which is not bad for a 3,300-pound car. This engine is rated at 20 City, 26 Highway. The other two models, the base 2.5 X and the luxurious L.L. Bean Edition, use a naturally aspirated engine that makes just 173 horsepower, but that’s still up from 165 last year, thanks to variable valve technology. Both engines feature Subaru’s renowned horizontally opposed four-cylinder engines. You know who else uses the flat engine configuration, don’t you? Porsche! The shape of the engine lowers the center of gravity for surer handling. The sound is still a little different, but the Forester is so well insulated and smooth that you’ll hardly notice. My test unit was a Crystal Gray 2.5 XT, so I got to enjoy blasts down the road with the turbo. With the five-speed manual transmission, the Forester is almost sporty, even with its conservative shape. You can order up a four-speed automatic if you would like to spare your left leg, but the driving will surely be less invigorating. The automatic won’t hurt your fuel mileage either; in fact, the City mileage figure is one mpg better! Subaru not only breathed on the engines, but they tweaked the suspension and braking systems this year. The engineers revised coil spring rates, changed the shock absorber valving, and modified the brake booster for improved feel. The Forester is not Subaru’s price leader, that’s the base Impreza’s job. So, the 2.5 X has such standard features as air conditioning with air filtration, cruise control, keyless remote, a security system, power windows, power locks, and power mirrors. Four-channel antilock brakes are included. You get a 100-watt AM/FM/Weatherband radio with single-disc CD. Little things like an outside temperature gauge, cargo area cover, and a rear seat armrest make everything pleasant. You can upgrade the car pretty quickly with the Premium Package, which for $2,350, makes the wheels alloy, upgrades the sound system, heats those external mirrors, slaps leather on the steering wheel, shift knob, and brake lever, and even provides a windshield wiper de-icer for those in cold climates. Putting disc brakes at all four corners and a limited-slip rear differential in helps, too. The L.L. Bean Edition continues its role as the pampering model. It gets its own snazzy wheels, comes only with the automatic, and gives you a very nice MOMO steering wheel, among other things. And the leather seats are embossed with the L.L. Bean logo, of course. The 2.5 XT’s biggest draw is the turbocharged engine, but it gets its own wheel package, subwoofer, and sportier gauges, too. It also wears a prominent hood scoop, like its cousin, the powerful WRX, with which it shares its engine. Depending on which transmission you select (or accept, in the case of the L.L. Bean Edition), your all-wheel-drive system will work differently. Both send power to the wheels that have grip, but the system that accompanies the manual transmission uses a viscous coupling locking center differential that divides engine power half front, half rear. If wheels in front or back slip, power goes to the other set. The four-speed automatic transmission uses electronically managed variable transfer clutch. This system can fine-tune its response to the road conditions, sending power to a single rear wheel if necessary. Besides the inherent safety of a well-build car and four-wheel traction, the Forester is mighty crashworthy, too. It earned highest ratings from the Insurance Institute for Highway Safety (IIHS).